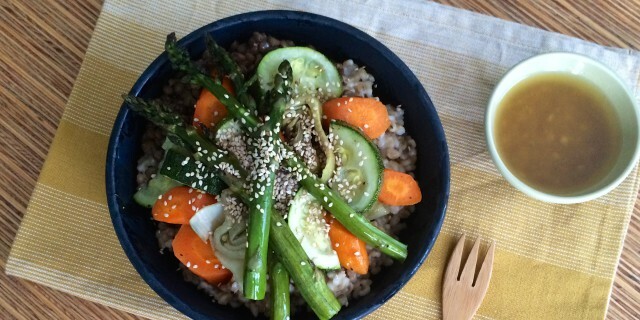 This Ginger Honey Veggie Bowl is simply a bowl of goodness. It’s pure and simple food that feeds your heart and soul. It’s what I crave coming home after a long, busy day. It makes me happy and helps me to restore my balance. It’s my idea of comfort food, good, honest and healthy food, rich in nutrients and easily digestible. Often when we feel tired or depleted, we crave the bad stuff, foods high in salt, fat or sugar. Junk food might give you a momentary high when you’re feeling low, but it depletes your body. As it places a huge burden on your digestion, it takes away energy. Energy you need to recharge and heal. This Ginger Honey Veggie Bowl nourishes your body, bring balance and gives you energy so your body can devote all its time to healing. It’s exactly what you need when you are feeling tired or low in energy. Because it contains all the good stuff -good carbs, healthy fats, protein, fiber, vitamins, minerals- you feel nourished and satisfied after eating a bowl. So next time when you feel run down and are craving food, get into your kitchen and prepare this bowl with love! Notice how much better you’ll feel after enjoying your bowl of goodness. Enjoy! Cook pearl barley or brown rice for 45 minutes. Drain and set aside. Cook brown lentils in plenty of water for 45 minutes. Drain and set aside. Place your veggies in a single layer in a non-stick baking tray. Drizzle with extra virgin olive and and season with pepper and salt. Roast veggies in the oven for 10-15 minutes or until nicely browned. I enjoy my veggies to still have a bit of bite so I usually shorten the cooking time a bit. Add cooked barley or rice to a bowl. Top with roasted veggies and sprinkle the dressing on top. Serve with sesame seeds and season with black pepper and sea salt.